Eva, Leo and Ron visited the Saltoluokta Mountain Station in Lapland for five days and four nights. Then we visited Max in Piteå for one day where he is working for the summer as a junior physician. Leo arrived Saltoluokta one day after Eva and Ron. We took an overnight train from Stockholm and slept in a compartment with only one other person. We were not so lucky on the way back--the compartment had the full complement of 6 people sleeping in a very small space. Eva and I were on the top bunk (of three) while traveling in both directions. The rain left us in the town of Gällivare (pronounced like yelli-va′-reh) where we boarded a bus for the trip inland. After around 2 hours we were left at a boat landing where we took a short trip over the lake to the mountain station. Eva and I took three hikes, a different one each day. The first day was a reprise of a hike we took three years ago to the Sami village next to Pietsaure (a lake), 6 kilometers from the Mountain Station; this time we visited the cafe at the village that is advertised along the way. We had a nice chat with the owner of the cafe, a Sami woman. Her husband showed up as we were leaving and we took a picture of them both. They and their daughter are the only summer residents of the village. They run the cafe and the boat rentals, and rent out cabins. The other sami in the area use this village for the birthing of reindeer in the spring months. The local couple live otherwise in the Sami village next to the Mountain station. The second day Eva and I walked partway up a nearby peak, one that we had topped three years ago, via a slightly different route. The third day we walked south on Kungsleden (royal road) down which Leo had traveled the day before. Leo stayed overnight in a tent at a spot 20 kilometers away from the mountain station. Eva and I turned back after we had gone passed the high point of this portion of the path, not wanting to duplicate Leo's trek, but hoping we might meet him on his return to the mountain station. He arrived later, after we had returned. Along the return trip we saw some beautiful rainbows which are shown in this set of images. On the last day We took the same boat and bus back to Gällivare where we caught a train to Luleå, and then a taxi to Piteå. The train company provided the taxi, in lieu of the bus seats we had reserved, because the train was four hours late and we missed the bus. After staying overnight in a travelers' hostel, we spent most of Sunday with Max, touring the town of Piteå and chatting at his rented house where he stays with four other junior physicians--for the summer. 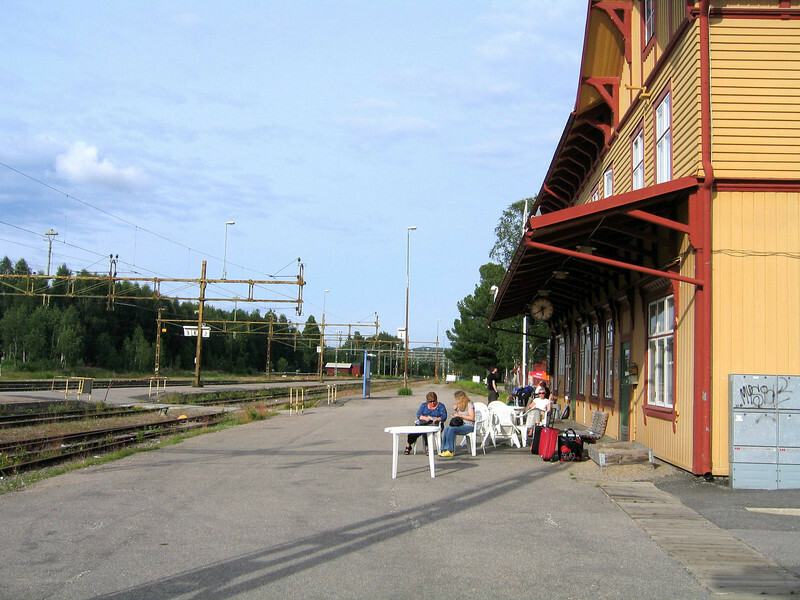 On our return trip, we took a bus to a little town, Älvsbyn, where the train passes through from larger towns to the north on its way to Stockholm. This train was also late, by about 2-1/2 hours. It was a long wait in the middle of almost nowhere. The last picture in this album shows the train arriving. We were always North of the Arctic Circle in this visits, so the sun set no earlier than 10:30 PM, and still gave us light a long time afterward as it slid under the horizon. we arrived Stockholm 90 minutes late.